New Delhi: New Year 2019 is almost here, bringing 365 hopeful days to your life. You can optimize them by resolving and committing yourselves to certain new goals. You can also promise yourself to break free from certain route habits and focus on new exploits instead. Prioritize and channelize your energies in sorting out your life a little more. Start by jotting down some of the New Year resolutions for 2019 that you are keen on taking up. 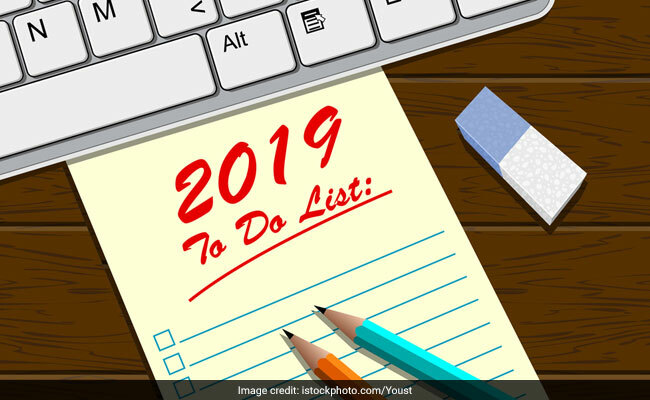 Here are some top New Year resolutions that are most popular, but you can figure out your own and most importantly, stick to them, to make the coming year a truly happy new year! If you have not been a very active participant in your friends’ parties, re-unions or family get-togethers, here is your chance to redeem yourself. Family and friends time should become non-negotiable in your life and you must resolve to give attention to all the people who matter in your life. Work on your relationships by healthy communication and striking a balance between your personal and professional life. In today’s world of virtual communication, don’t sideline yourself from the social media game. Your posts don’t have to be about everything you eat, visit or travel to, but make your social media presence felt by sharing and posting things you believe in. Expressing things out in open is sometimes very therapeutic, and you never know what may follow – an opportunity, a meeting, a long-lost friend pinging you. Being dormant on social media will not help, neither being too over-enthusiastic would. Just keep it real and share a part of your life with a close set of chosen few. A rejoinder, always make time to meet them in real life. That’s still irreplaceable, isn’t it?